I am back at creating for Falliday again today (and yesterday). I had fun trying some new techniques too. The dendritic technique is similar to a TJ technique, but I did it between pieces of a CD case. I added some Iridescent medium to the purple paint so it has shimmer to it too. Images by Paper Smooches. This card used yarn wrapped around a block and dipped into white paint. The challenge is names, "It's a Blizzard". Therefore, I wanted to make a snow scene. I opened a SU die drawer for another die, and shamefully, found this set of dies I did not even remember I had....so, I opened it and put it to use. The glitter is Sparkle and Sprinkle. The sentiment is also SU and is embossed in Silver EP. This card is using a technique where you use water to make your stamping run. I ended up re-coloring the image with markers and re-stamping, as the image had too much detail to leave as it was. I added edging with a glitter pen. The sentiment is SU. 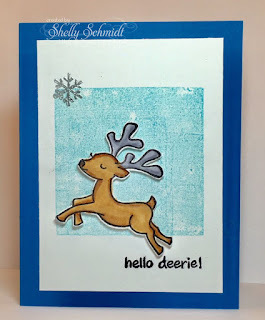 I have never tried this technique before- you ink up your stamping block and use it to make an impression on your cardstock. The challenge, Ceal, is the queen of CAS so I challenged myself to make a CAS card. Images by Lawn Fawn. 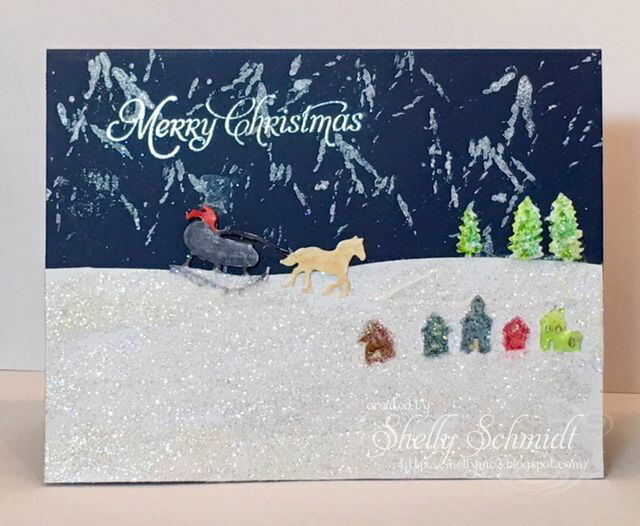 Shelly, wow you are really getting some wonderful holiday cards made and using some great techniques. Those are great cards. You have been busy Shelly, and these are fabulous cards - I love putting Iridescent medium on my cards - I have one to blog that I made in the weekend, but cannot blog about yet... 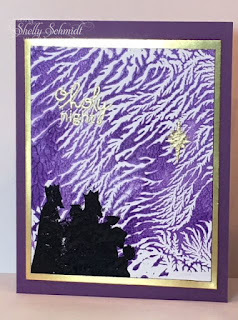 Your technique on the top card looks amazing I am going to have to look it up and find out how to do it. I knocked out a lot of Christmas cards with the FF Challenges, too! These are awesome!! I really loved that first technique and was amazed with the results. Your purple background for the wisemen is perfection!! These are fabulous. I know I've said it before but again, you absolutely amaze me with your creativity.